Ichak Adizes, through his organization the Adizes Institute is best known for his work on the corporate life cycle. The life cycle provides us with a simple way to think about and understand the various stages a business can pass through, from inception through to ultimate cessation. Although its possible to infer much meaning from these one word descriptions, more detail is provided in the image and descriptions below. This stage represents the very beginning of the business, where it is initially formed from an idea, and an initial embryonic product or service begins its life. Here the product or service has reached a point where the first sale can be made and the business begins to trade. At this stage the business will still be very small and fragile. This is when the business really starts to become energetic with lots of different things happening at the same time. The business is still very young and so its business model could still change at any time. The business is often very chaotic at this stage with particular individuals often fulfilling multiple roles and minimum process and procedure in place. Just like with humans, in this stage the organization is still developing but it has form and it is possible to see its shape when it reaches its prime. The business is still not yet mature. Here the business has reached its peak of fitness – it is profitable, lean, and very competitive in the market. The business has processes in place but they are balanced, and information flows smoothly and regularily throughout the business. At this stage of its life a business is slightly past its prime. It can still be hugely profitable and lean but it is beginning to lose its edge, and on the verge of becoming complacent and losing its way. 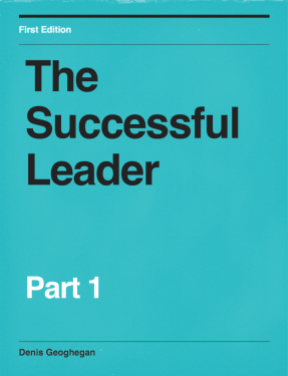 By this stage the business is an incumbent – big and slow to change its ways. It will naturally be the target of disruptive smaller companies that will try to steal (sometimes successfully) its market share. By the time the business reaches this stage internal issues start to surface, and focus is being lost on the original customer needs. By this stage the business is so large and complex that it begins to trip over its own feet. Bureaucracy and administration which serve no customer purpose begins to dominate, as does interdepartmental politics. For one reason or another the business finally ceases to be. This could be because of bankruptcy, or because the business is sold, amongst other reasons. 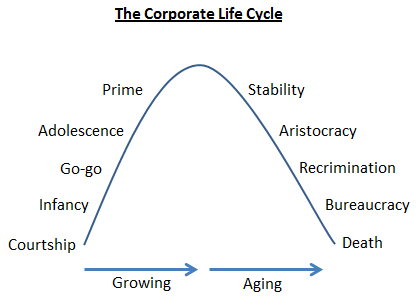 One thing to keep in mind with the Corporate Life Cycle is that businesses don’t necessarily pass through stages in order or even through all stages. It is obviously possible for a business to jump straight from adolescence to death, for example. It is equally possible for businesses to reinvent themselves either internally or by purchasing another company, to move themselves back to an earlier, more desirable stage.